I went to my kitchen sink this evening with supper dishes in hand and in a sweet surprise, I saw a very young fawn walking through the front flower beds. 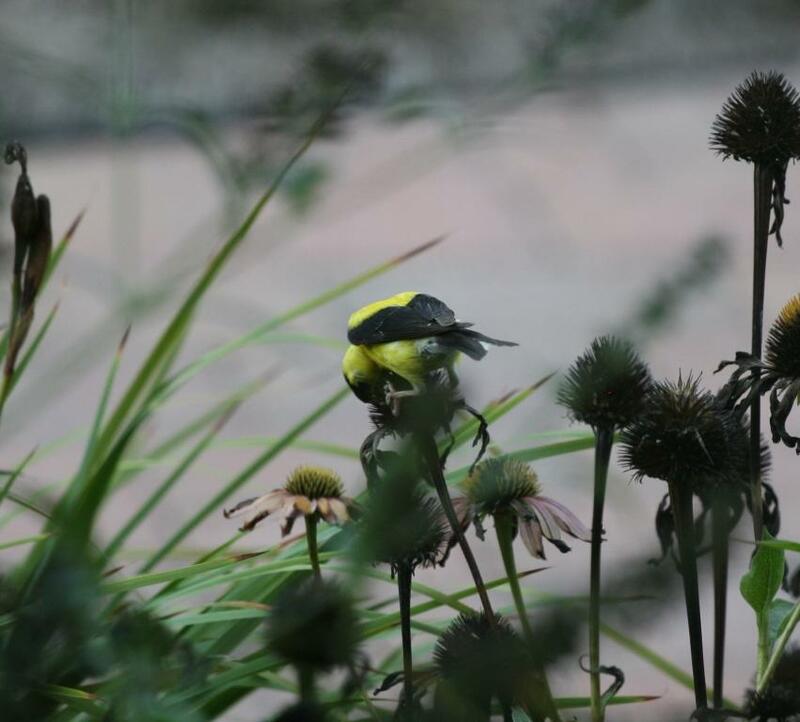 It was dwarfed by the cone flowers, black eyed Susan’s, and even the bird bath as it meandered through the flowers, checking everything carefully before skittering out. 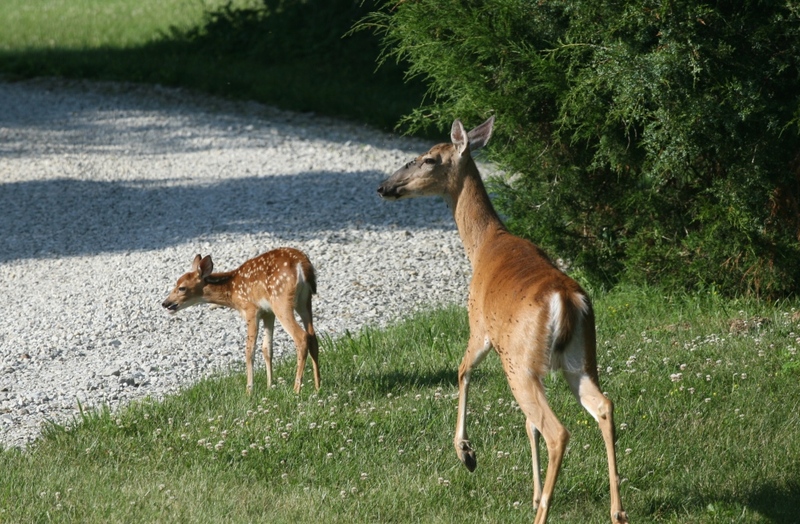 Fortunately, I had heard this morning that a doe was wandering around with a new baby and I had brought up my camera with the telephoto lens already attached. I ran to the living room to get it and when I got back, the fawn had rejoined its mother. It skipped about the yard, more I think from the gnats and flies circling it than from playfulness or fear. I could see quite the swarm flying around both of them. Mom finally edged her baby back into the woods and I went back to the dishes. I have just started a new painting in the studio of blueish flowers but it isn’t very far along , so I thought I’d share one of the funnier things the wildlife have done out here. 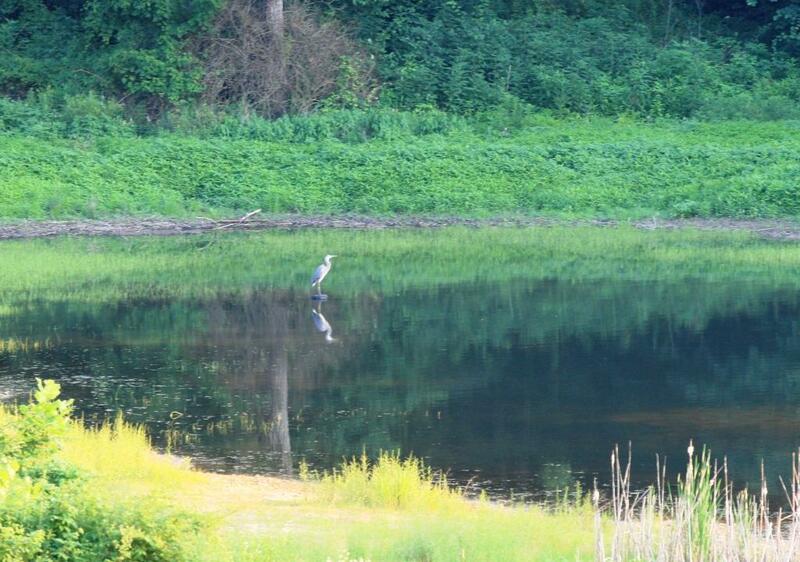 Last Monday, I happened to glance out on the lake and saw a great blue heron perched on a stump out in the shallow end. He was just relaxing, grooming himself and bending his head and neck down over his body, looking for all the world as if he wanted to take an evening nap, safe out in the middle of the water. I went and got my camera and took a few shots of him. I put the camera down because it was slowly getting darker and I wasn’t sure how these would turn out. I happened to glance back a few minutes later and saw a doe walking on the shoreline and I thought, what a chance to get a picture of the two together. I took a few more pictures hoping that one might prove passable enough to post and then, once again put down the camera. 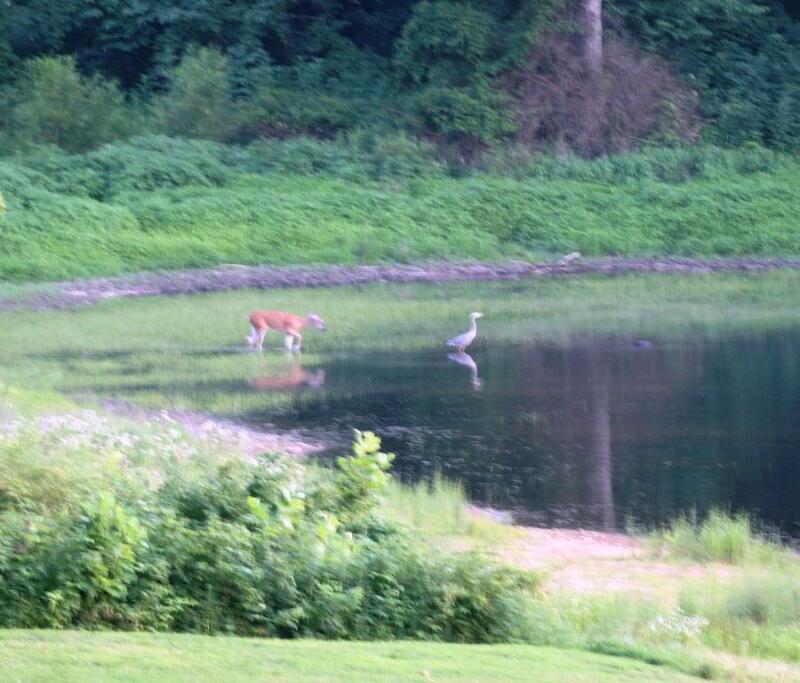 Shortly thereafter, I noticed the doe in the water, slowly making her way around the heron. Then things started to get interesting – for everyone. The doe began ducking her head under the water and then tossing it about, dancing around and making her way closer and closer to the heron. He just kept eyeing her placidly, as if he couldn’t quite figure out what was going on. She made a slow circle around him, getting closer as she went, until finally she got right up to him and then seemed to almost poke him. In as dignified a fashion as he could manage, he hopped off the stump and headed towards the shore. She followed and proceeded to chase him back and forth along the shore. Eventually he made his way back into the water near the stump. She continued to follow and walked behind him all over the shallows too. 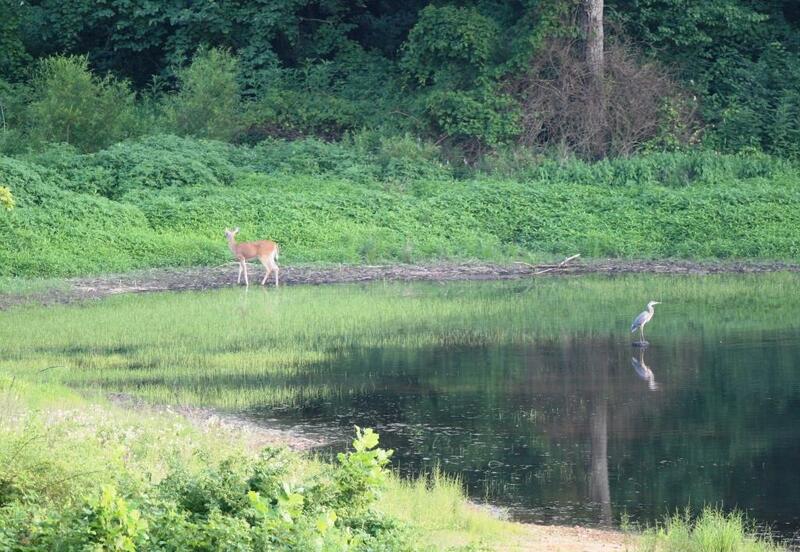 This all seemed to be done in slow motion as if she were playing with the heron like she might with her fawn. No one got too excited and it was just this quiet dance between the two of them. Finally she tired of teasing him and walked off into the woods. He resumed his perch on the stump as if nothing had happened. Sometime later in the deepening dusk, he departed, too. I felt privileged to see this lovely wildlife vignette and to be able to share it with you. We have strung a few nice days together lately – or at least parts of days, We have had some pleasant mornings into the afternoon before the thunderstorms pop up. I am grateful that we haven’t had the terrible storms and tornados that parts of the rest of the country has seen. I don’t think there is a building code established that will help a structure withstand a direct hit of a tornado. I have started on the next work, lining it out and beginning a little of the landscaping. Not enough to show yet. I did look at some animals to do but wasn’t drawn to anything in particular, so I just went on with the next Ohio entryway. This one is definitely a Tudor. 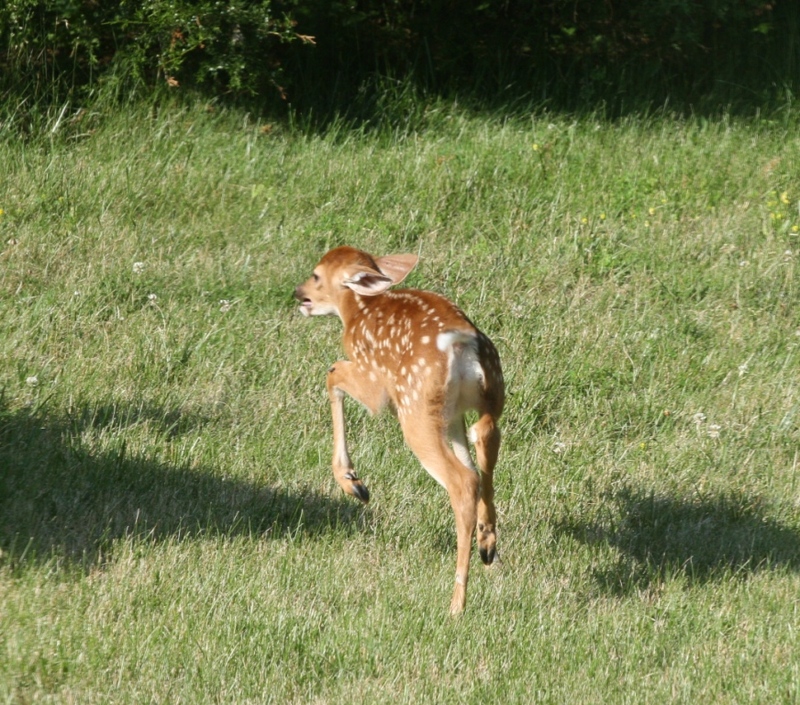 In the meantime I have been keeping a close lookout for this year’s crop of fawns. 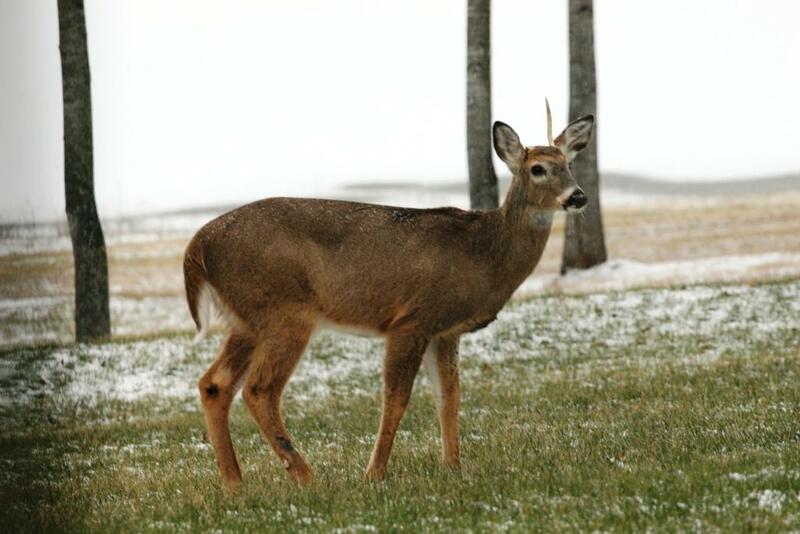 They often start to show up about now and I would love to get some pictures this year. We did see a herd of deer earlier in the week. I thought it was all does but when I got out the binoculars to get a closer look at least one was a buck with half-grown antlers in velvet. I think it was the “big guy”. The antlers were multi-tined and very fat, Unfortunately, I was on one floor and the camera was on another. They were crossing the lake at the shallow end, slopping through the water and then quickly moved into the trees, so no picture. I will keep a lookout now that I have seen them. I never realized that the antlers started to grow this early and that is going to be quite a set. I have started to pick flowers from the beds to bring into the house again. All through the year, my husband gets me a small bunch the first of the month as a year round birthday present. One year when he asked what I wanted as a gift, I said flowers every month. He just has to go to the grocery store and spend $5-8 on flowers and I am happy. 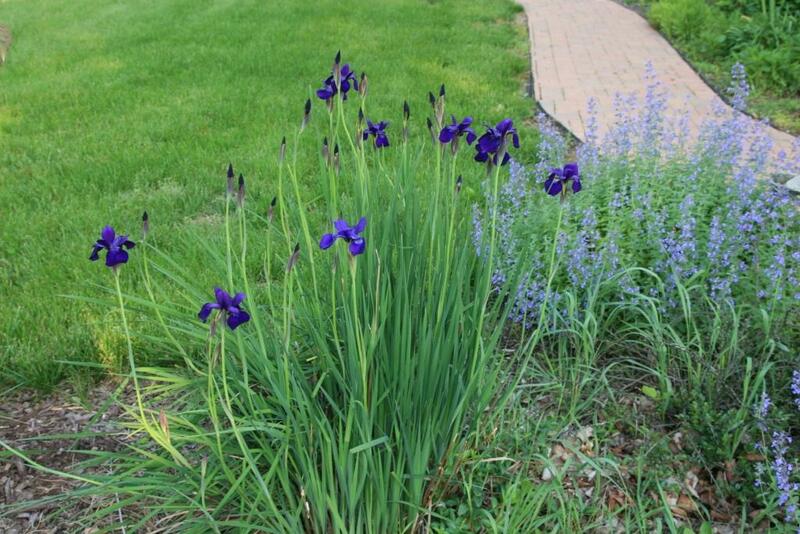 In the months that I have blooming flowers like my daffodils, irises and peonies, he gets a break. 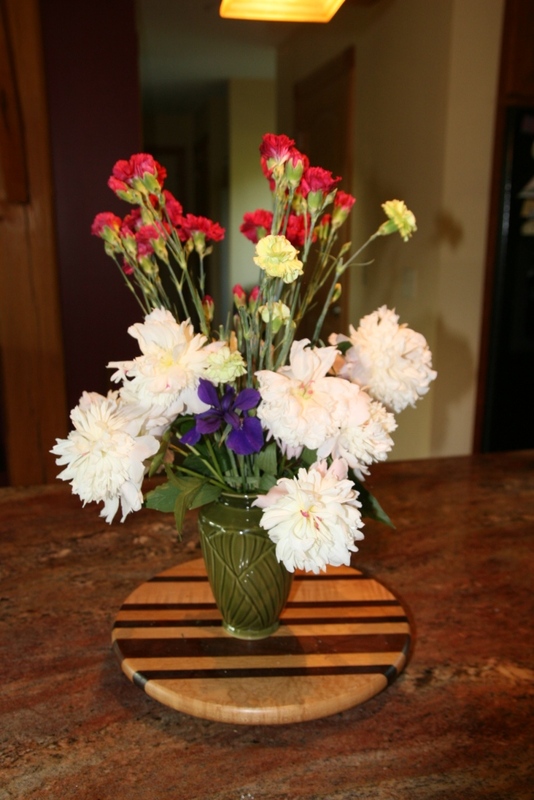 Otherwise he finds me some nice carnations or daisies that are long lasting and we are both happy. This is a great gift and not too expensive. I have told this to a few other women I know and everyone thinks it is a great idea. No one has done as well as my guy though, from what I hear. Anyway, right now there is the lovely smell of peonies in the kitchen. They are from my Grandmother’s or my Great-grandmother’s stock and have to be at least 40-50 years old – maybe up to 80 years if Great-grandma planted them in the twenties. I just don’t know. They always make me think of Grandma though and that is nice. Guess what? It is raining. Again. Thunderstorms overnight and now a misty haze. Just enough to make outside unpleasantly damp. We did get a few days of nice weather. The trees are all coming out and the undergrowth is flourishing. I was none the less surprised when I looked out of the kitchen window last week and saw a zebra swallowtail. Then yesterday I saw another. I have heard that the zebras are rarer than the tiger swallowtails. I can say that I normally see a lot fewer of them. Several times last summer I saw a dozen of the tigers at one time on my butterfly bush. Truth in advertising, I guess. Unfortunately, the bush died because of the cold weather and I will have to replace it. 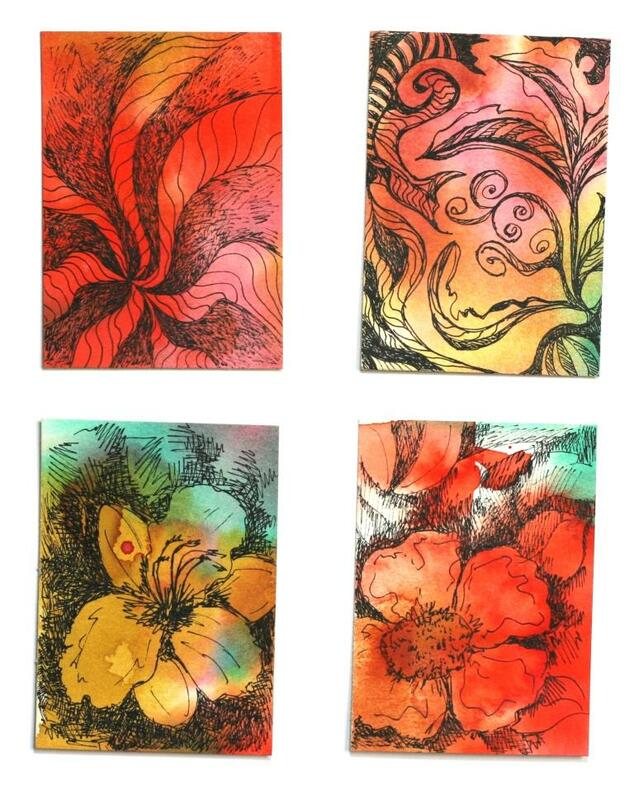 I really liked the iridescent quality of the one I had and I hope I can find one to match. And with all of the rain, weeds that I pulled and threw aside have lived and tried to regrow. Darn dandelions are hard to get rid of. I had a pile and they all just continued to bloom and grow. I now have mounds of growing weeds. I picked most of them up and threw them farther into the woods. It is supposed to dry out on Tuesday. Perhaps then I can plant the flowers I succumbed to buying yesterday when the sun was out. The wildlife is flourishing, too. The lushness of the spring growth is matched by the numbers of animals we have seen. 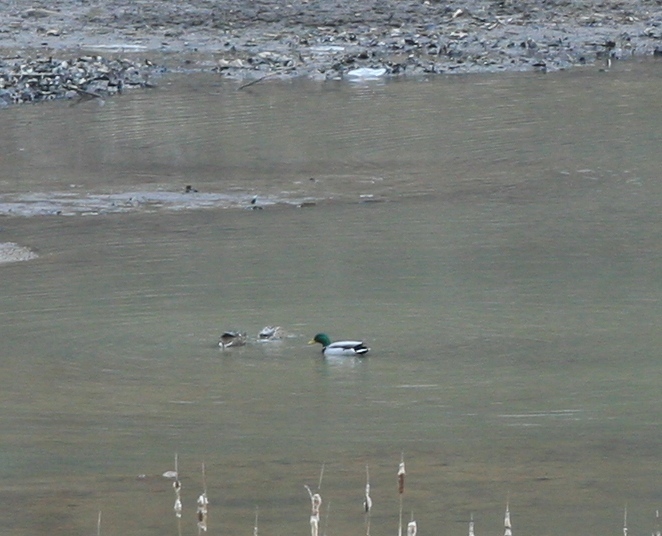 There have been mallards on the pond in addition to a few species that I can’t identify. Last year we had a pair 0f grebes (I think). Unfortunately the babies were eaten by the snapping turtles. We hope for better this year. 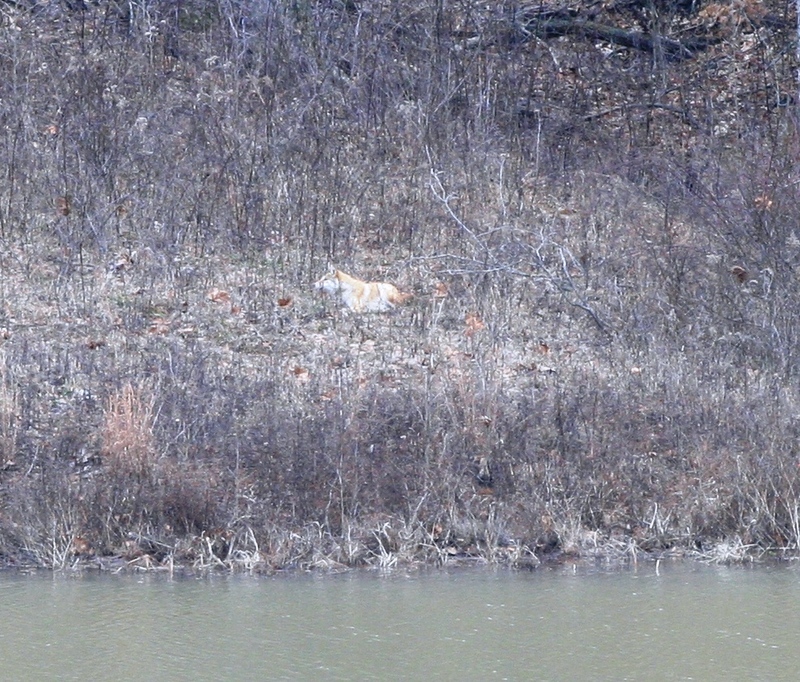 And you won’t believe it but early one morning last week, I saw a coyote walking next to the lake. 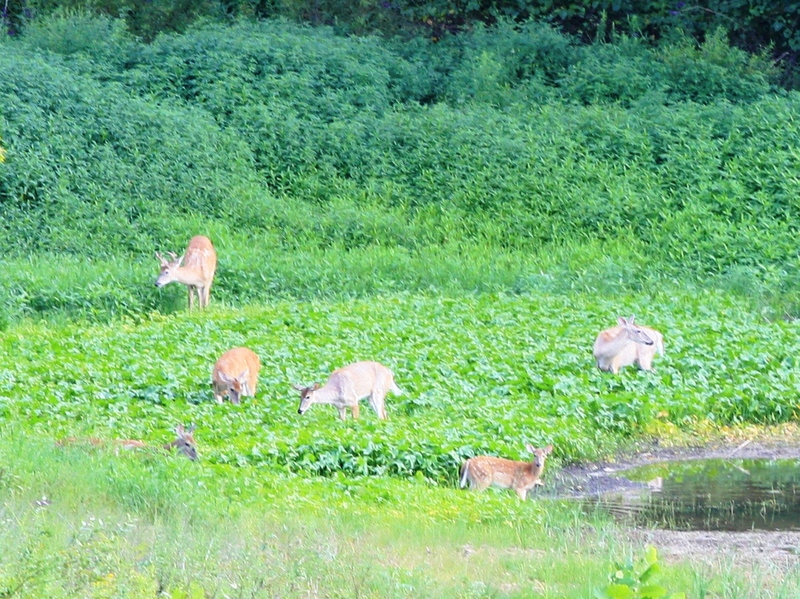 I went to get my camera, and in that time a doe walked into the picture. 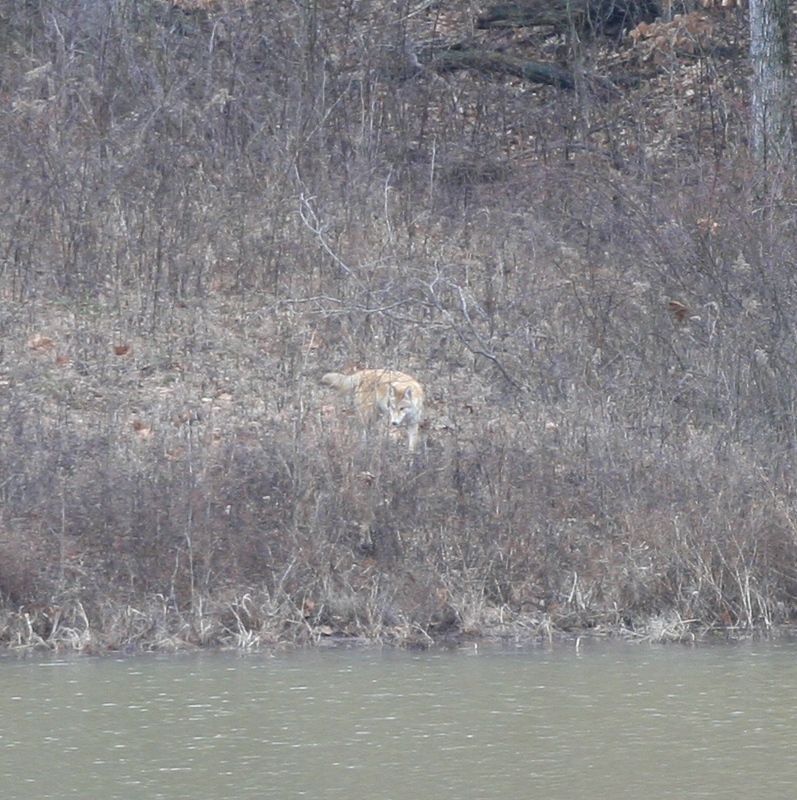 She trailed the coyote for a while and then eventually caught up with him. Each knew that the other was there, but no difficulty ensued while I watched. I actually got the two into one picture frame, but the shutter speed was so low due to the light that they were both blurry. I am trying to get the photo cleaned up, just like in the crime shows, but don’t know if it is possible. If it can, I will post it. I never knows what will be out there when I look. I am still waiting to catch the tom turkeys displaying. 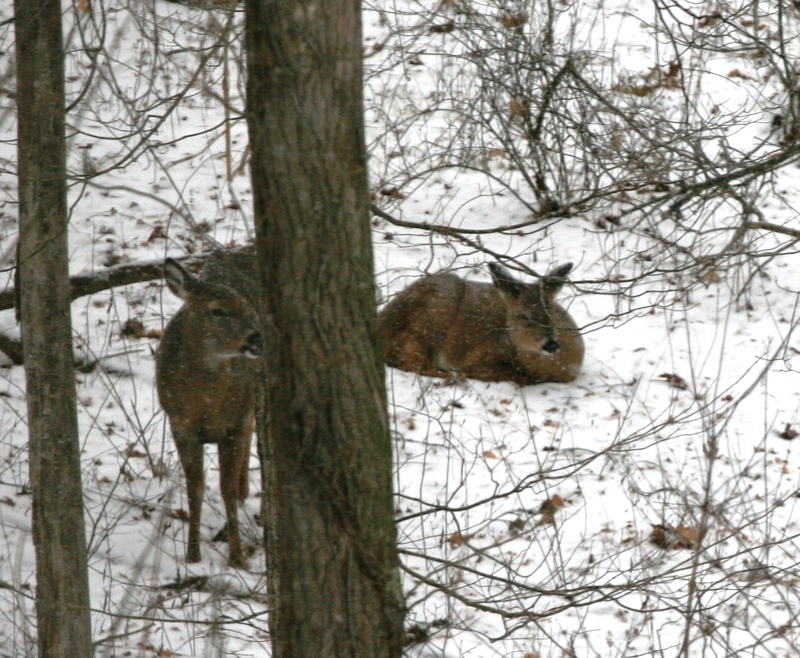 The spring fawns should be out soon too. I have almost finished the inking on my latest drawing. It is a little smaller entryway from house in an historic Indiana town. Much less imposing but inviting none the less.